A rich, intensively moisturising cream mask for the skin under the eyes. It restores, smooths and maintains the correct moisture level of the skin. It also alleviates, brightens and reduces wrinkles caused by dryness. Dry to very dry skin under the eyes and any type of skin, regardless of age, in need of strong moisturisation, improved elasticity and reduction of wrinkles caused by dryness. 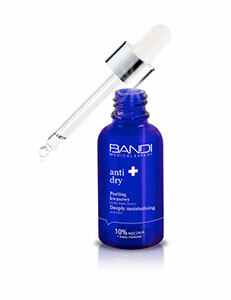 The ANTI-DRY line products contain highly active ingredients with deeply moisturising properties. They smooth, relieve irritation, alleviate wrinkles and reduce sagging caused by low moisture levels of the skin. Indications for use: Dry to very dry skin experiencing temporary and/or persistent dryness, regardless of age. Wrinkles and sagging caused by low moisture levels. - restored protective functions of the natural hydrolipid layer of the skin. Apply the formula for the night to the skin under the eyes. Due to its rich consistency it is not recommended to use on the upper eyelid. In order to improve the general appearance of the skin and moisturisation of the skin of the face, use with other ANTI DRY products.